Julie & Tony Hook of Hook’s Cheese Company are the epitome of what makes Wisconsin “America’s Dairyland.” For 40 years they have been sourcing milk from 22 Holstein Dairy Farms in Mineral Point to produce their ex-pert selection of blues & aged cheddars. 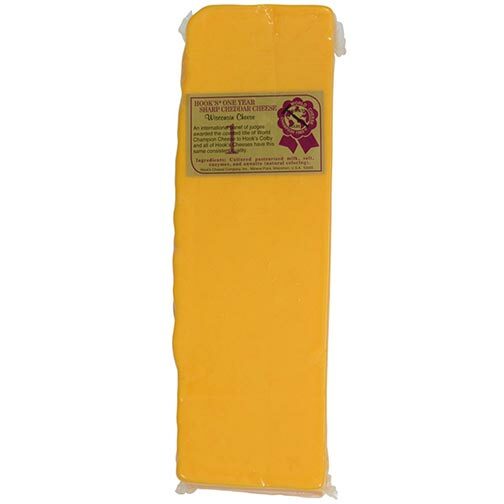 The foundation of their aged Yellow Cheddars is the 1 year. Rich & bold, this prime age exudes a meaty earthiness, heavenly sharp blow & thick creamy paste. Kick that industrial cheddar off your menu and make this your next burger cheese! Ingredients: Cultured pasteurized milk, salt, enzymes, and annatto (natural coloring).